Client was using QuickBooks for paying bills, and an outside payroll service for payroll. Came to Off-Site with a QuickBooks problem. Reviewed the charges from the payroll service. Off-Site is now providing them complete QuickBooks assistance twice a month for half the cost of the payroll service. Example of client who had a full‐time bookkeeper, and switched to Off‐Site and hired a part‐time clerical employee. *Other costs include Workmen's Comp, Unemployment, etc. 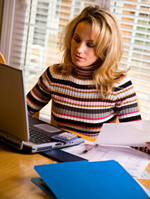 According to BIGresearch, Accounting services account for 16.9% of small business expenses.